SYS-2029BT-VSNF22N Supermicro introduceerd de laatste All-Flash NVMe X11 BigTwin™ solution met Intel® Xeon® Scalable Processors an Intel®Optane™ Technology. Supermicro’s SuperServer 4028GR-TXR(T) supports eight NVIDIA Tesla P100 SXM2 GPU accelerators in 4U to provide maximum performance for mission-critical HPC clusters, Hyperscale and Deep Learning workloads. 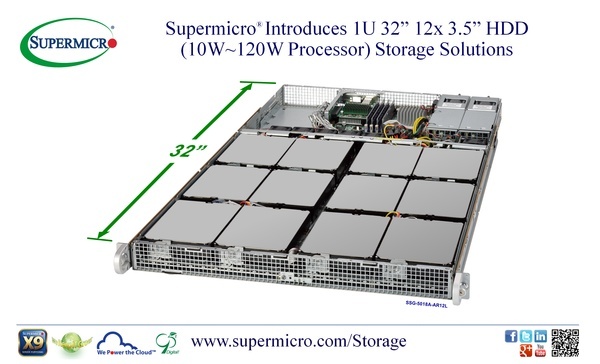 Super Micro Computer, Inc. brings to market a new, compact, cost-effective storage solution with its new SSG-5018A-A(R/S)12L SuperStorage Server. The new 1U storage server is the best solution for today’s tiered storage architectures that need rapid access to data with minimum power consumption and heat dissipation.